Because I just nabbed this article off of the Tanith Lee mailing list. You must go read some LEEEEEEEEEEEEEEEEEEEEE! I cannot begin to tell you how much her books mean to me. She’s dreamy. ♥ The Flat Earth series, specifically Death’s Master. 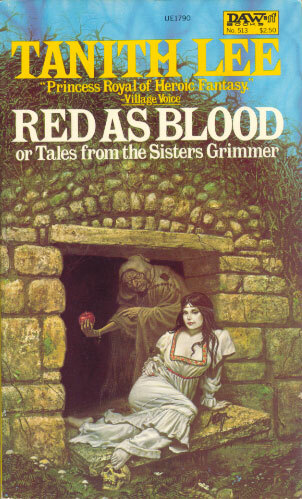 ♥ Red as Blood, or Tales from the Sisters Grimmer. Duh. ♥ add an “All Tanith, All the time” page to Book Whores. ♥ buy new books. I’m woefully behind! Metallic Love, Fatal Women, & Death Of The Day. Meh. Agreed. She is so, so overlooked and under-applauded . . . I would love to see a page devoted to her on Book Whores! Thank you so very much for highlighting this wonderful article about the goddess empress Tanith Lee. I will never understand why she is not better known than she is. Her books stay in your soul forever. I’m so glad to find someone else who knows and loves her old work! Previous Previous post: Clearly I’m a little slow on the uptake.